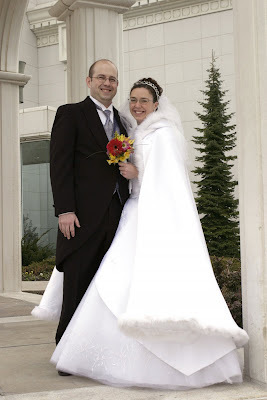 Justin Call and Jennifer Lance were married in the Bountiful Temple. 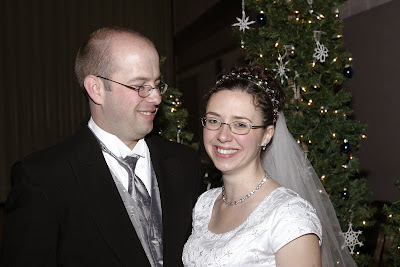 We had our first date on September 17th, 2004 a mere 104 days later we were married. Sheesh...talk fast! I thought my parent's courtship was fast (they were engaged like 2-3 months). 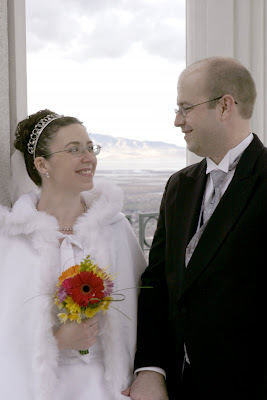 Our wedding day was freezing cold. The wind was pretty stiff and cold so we did not get many pictures, my veil was waving about like it had a mind of it's own. 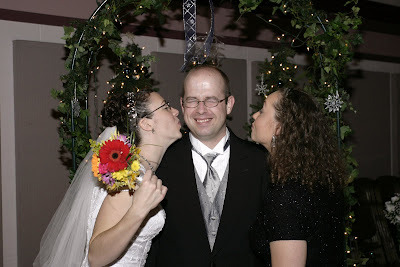 I remember having a silly grin plastered on my face the entire ceremony and after. I think my face hurt for the next three days. The one piece of advice the sealer gave us...me...that stuck with me was this: "do not nag your partner, instead politely ask once, set parameters, and then followup. " I try to stick with that advice, which tries my patience more than it should. Our reception was a low key affair filled with loving family and friends. Now five years later we have a full book of memories both good, better, trying, and sad. Our two children brighten our marriage two-fold. We still pursue our road biking hobby and added a full plethora of new hobbies. Justin worked for KPMG 7.5 years then made a job change to Cabela's headquarters in Sidney, NE. He does an excellent job of supporting our little family. I get to stay home and raise a very opinionated Amelia and relaxed Phillip. I felt like Ruth when we moved to Sidney. I was working as a welfare worker when I met Justin. I worked until we had Amelia 2.5 years later. 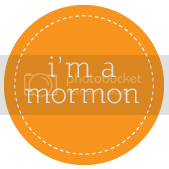 Now I keep myself busy with several at home ventures including photography, sewing (ScrapShirts), and crocheting. I will soon add piano lessons back into the mix. We enjoy the time and lessons of our life so far. We look forward to the future years. I love my man. He is a great father, provider, entertainer, and husband. Here's to the future!!! I am so grateful that Justin allows me to be me. He teases me about all my projects and crazy ideas but still gives me the space to be creative. He is perfect for my (almost) independent personality. Justin tries hard to please me and built our friendship.